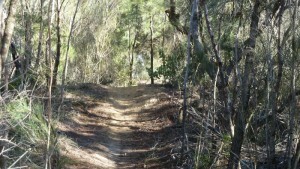 Menai (Lucas Heights) Mountain Bike Trail. Menai (Lucas Heights) mountain trail. The Menai mountain bike trail opened in 2014. It’s a single track with the main couple of loops being about 10km. There are a few side tracks as well if you would like to extend the ride. So you could easily get 15+km’s out of the mountain bike ride. It’s extremely well posted so it’s hard to get lost. You can only go in one direction to avoid head on’s. It’s quite technical in bits so you may have to hop off occasionally if your your mountain biking skills are at intermediate level. With my sub standard skill level I hopped off here and there. Turn left onto new Illawarra rd. Ride for approx. 500m. Turn right onto Little Forrest Rd (entrance to the tip). Ride for about 1 km to the entrance of the tip. There’s a large fence. You can go around it on the right. Follow fire trail for approx 2 km to the trail head on the left. Menai Mountain Bike Trail Map. Menai Mountain bike trail photo gallery. Google Maps Link. Park at the Antso carpark to access the Menai/ Lucas Heights mountain bike park.